In March 2013, I had built a niche website on a health topic on which I had to research quite a lot. No wonder, I was able to rank it really well with none other than the ‘PBN’s’ which I had built from my knowledge over 4 years in SEO. The site was generating over $600 of passive income monthly after 5 months of work and most importantly patience. The most crucial and important thing that helped me rank this website was the 30 PBN sites which I had crafted beautifully so that I can get the maximum link juice from them. Today, I will tell you some secrets which you can implement on your niche website and private blog network in order to sustain long term rankings easily with minimum work. You might be wondering what’s so special about PBN’s? Why choose them over the traditional link building methods to rank higher? Why I choose PBN’s over all other methods to rank quicker as well as without fear of losing rankings in the long term? Let’s start with the facts and figures,the PBN strategy was introduced back in 2010 when many people tried ranking their amazon affiliate niche websites by the use of PBN’s by hosting all the PBN websites with different C class IP’s. People could see a significant jump in their ranking when they used this technique and their competitors were startled as they couldn’t make out how they were being outranked so easily! In September 2014, Google created a new algorithm which was aimed at penalizing the websites in a particular blog network as they had very thin content and they weren’t updated since a long time. So a lot of websites were de-indexed over the period of 4-6 months in 2014-15. This taught a lot to the website owners and it’s quite amazing to know how the SEO and bloggers community has grown and how they help each other to understand things and act in the right direction. Statistics show that the efficiency of a Private Blog Network has certainly increased over time even after the penalty by Google. Moreover, the websites ranking on top of Google for the most competitive niches use PBN’s to stay at that place. What decides your fate while using a private blog network is the tactics you use in order to get the most out of your PBN. When you build a PBN, you need to do it right and not prefer methods which don’t comply with the Google search engine guidelines. To make sure you all succeed in this year while creating your own PBN, we have prepared a check-list of the Do’s and Don’ts from our experience of 4-5 years with PBN which will really help you to rank your website higher without getting a manual penalty from Google. So let’s begin! Producing Spun, low quality and thin content for PBN sites: A lot of people think it’s easily possible to publish around 5-6 articles having spun content on a high authority expired domain and getting the ink juice from them. But this is totally against Google’s vision so try to avoid this! Hosting your PBN on C class IP’s: There has been a trend of hosting the PBN websites on the C class IP addresses which are a big footprint to get penalized. As Google is getting smarter, it is advisable to mix things up and not follow a set plan as SEO requires diversity in all terms. 301 redirects: The 301 redirect involves a lot of work as well as risk. You would have to add lots of content relevant to your niche and then point it to your website which means you can’t use it to point links to your other websites as well. Google algorithms can be very strict towards 301 redirects as well. You can say PBN is a controlled process while 301 is a bulldozer. Outbound links: Maintaining the number of outbound links is very important. There should only be one article on your PBN site pointing to your money site as if all the 5 articles would have links to your money site, it wouldn’t look natural to Google. Get Social Signals: Boosting your PBN website with the social signals is a great advantage. As Google gives a lot of importance to the content marketed on the social media websites like Facebook, Twitter, Google+ and other sources. You can create some social profiles related to your niche or brand and point numerous social signals by sharing the content on your website or even buy some services. Besides seeing your current IP, the site also shows your ISP’s ASN. A click on this number shows how many ASN peers your current ISP has, as well as some other information. On this website, it is also possible to find the ASN of any other website by typing in the URL of the website, then select the tab “IP Info”. The last number (the one beginning with the letters “AS”) is the ASN, followed by the hosting provider. Keep in mind that the ASNs don’t change hands as often as IPs, they are an excellent tool for pinpointing where a website is hosted. Quality Content with fresh Information: Writing quality content on your PBN websites is very important, I personally prefer iWriter where I get my articles written at $3 for 500 words easily. You just need to Sign Up on the website and click on ‘Get Content’ and enter the specified details for the project and the interested writers will start bidding for it soon. You can hire the one with good skills and minimal charges quite easily. 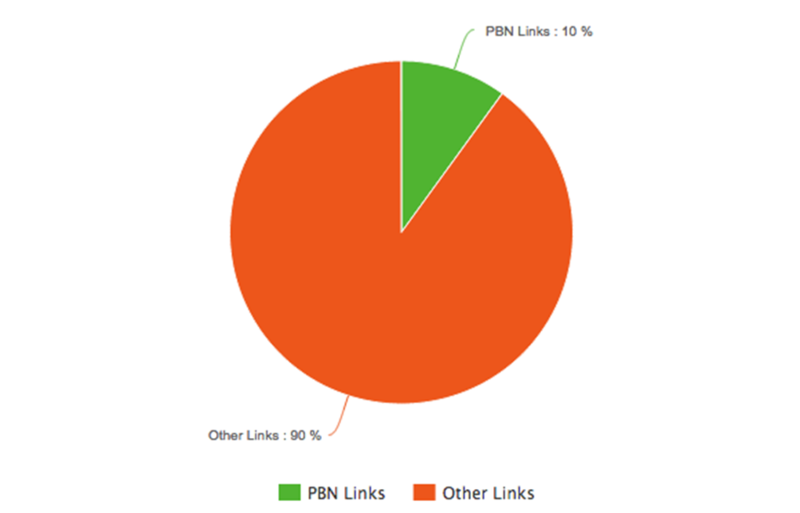 Outbound links: I personally point out only 1 link to my money site from the PBN site. Let each of your articles also have 2 – 3 other outbound links to authoritative, non-competitive web pages. This is really important because these links provide context about the article and Google takes note that your money site is linked alongside authoritative web pages. Well, I have tried to put a maximum of my experience out in the above 5 minutes read. I really hope you go out and build a successful niche website and rank on the top of Google by building the most amazing and authority PBN in your niche and even use it for other money websites. If you have any queries or doubts regarding any of the steps mentioned above or any SEO related questions, feel free to comment below and reach me out. I will be the happiness to help you in the best possible way. Cheers! What is Core Search Algorithm Update? Many people were speculating the Google search update as a Penguin or Panda update which took place in couple of weeks at the start of January 2016, but it was confirmed later by Google that it is not more than just a ‘Core Search Algorithm Update’. Several website owners noticed a huge shuffle in the rankings while entering the new year 2016 and the news which was really important was that Panda algorithm is no longer a standalone one but has merged into the core search algorithm. This core search algorithm update was launched on 10th January 2016 followed by a major update on 16th January 2016. It was aimed at a range of search quality parameters and affecting websites globally. This update was a clear indication by Google that content quality is the most important thing on which you should focus immensely if you are a blog/website owner. Some of the data and webmaster reports convey that the ones who gained the most were those who had perfectly optimized the category URL’s and properly interlinked their website content. If you would ask me, I would say tailor and curate your content in such a way that it is easy for the visitors to locate what they want to find. Is PBN going to be dead after this update? This is the question that is probably going through your mind if you are a online marketer who earns a living by creating websites focusing on different profitable keywords. Well, you would be surprised to know that the answer to this question is ‘NO’, though the conditions do apply. A private blog network has been a very successful weapon and can help you quickly improve the rankings of any website. PBNs have proved their worth by increasing the rankings of websites in almost every niche and people are making $$ to $$$$$$ figures per month from their money sites. There are also some very successful and famous people who have ranked their money sites. Some to name are Tung Tran from com who sold his website bestadjustabledumbells.com for $10k after ranking it #1 in just 38 days. Jon Haver from AuthorityWebsiteIncome.com created PayMyStudentLoans.com which generated over $3k/month from search engine traffic. He has even shared some secret ideas on his website about how he used to pick relevant expired domains and redirected them to the individual posts. He claimed that this websites was highly promoted using a strong private blog network. By now, I am pretty sure that you all are convinced that PBN is all time win strategy which you should follow if you are willing to rank on Google for your favorite keywords. PBN is not rocket science because hundreds of people today own PBNs ranging from a 5-site to 100 or even 1000-site PBNs and making tons of money using these. What makes these people stand out? How do they build such a PBN which is risk-free and very powerful? Below are some of the super exciting tips from my side which can help you as well to build such PBNs which would help you to achieve sustainable rankings for your money site. An expired domain must have good metrics with a good TF/CF and DA. Make sure that the count of the metrics is at least 15 and is relevant to your niche. It is strongly advised to register those domains with different accounts and host them on unique A or C class IP addresses which helps you not leave a footprint and stay safe from Google penalties. There are two ways by which you can build content for your expired domain PBN site. One way is to create new blog posts which are relevant to the domain and the other way is to restore the content (text or images) that used to reside on the previous version of the website. It is a good practice though care needs to be taken as it might be possible that a new version of the old website may be existing. Always keep the content on the website thick and relevant to the niche. It will help you to build authority for the PBN sites in the eyes of Google and the links from these domains will pass more juice to the main site eventually. It is a good idea to throw some social signals at the PBN sites as it wouldn’t look natural if one high authority websites are rebuilt and suddenly pointing to a random website. The last and the most important thing which I want you to take care of is the link placement or link velocity. Make it a practice to use PBNs as a supplement and not rely totally on them. 80-90% of your links should come from internal pages like guest posts, business listings, branded properties, or niche blog/forum comments. If the PBN links occupy 4-20% space on your overall link profile, then you are pretty safe and make sure you maintain good interval while adding links. In this race of SEO if you (racer) drive too fast, you would be knocked down by Google (police). So the slow and steady wins the race here. If you have any queries or doubts, feel free to comment below and discuss, I will be happy to help you. Are you finding it hard to hire quality as well as affordable content writers for your PBN sites? Does managing your PBN sites worry you every now and then? Well, you have ended up at the right place as today we will be discussing how to use the WayBack machine for restoring the web pages of any website. You can rebuild the whole website by using this method and keep it fresh and updated using the old content which used to reside on the site. A PBN site is usually an expired domain with some quality metrics like DA, PA, TF and CF. The most vital part of maintaining a private blog network is to regularly keep it updated so that it can pass the link juice to your money site as well as sustain the authority of the particular PBN domain. You would be amazed to know that you can rebuild the whole website by using the WayBack Machine scraping method. You can even restore web pages using the Google’s cache, but once it has updated you wouldn’t be able to see the earlier versions of a specific page. WayBack Machine can be used to search for the previous versions of the website (or pages) and use them to rebuild the site. Once you are done recreating the page, rename that file as the page name which needs to be replaced and you are done! So this was the process of manually scraping the previous version of any website in order to rebuild it and use it as a part of your PBN. It’s a great method for recreating and keeping your PBN site fresh by using the same old content which is perfectly relevant to the domain. However, the process can be really tedious if you are aiming to scrape more than 1 websites and if you own a large private blog network. There are some services which help you to deal with this process for a charge. 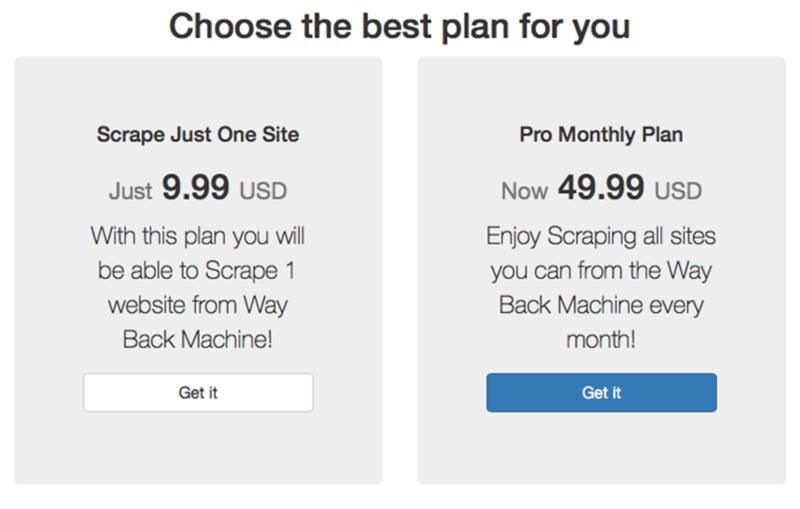 Let’s have a look at two of the most popular used WayBack Machine website scraping services. ArchiveScraper.net – Archive Scraper is a great service if you are looking to download the whole website and recreate it. 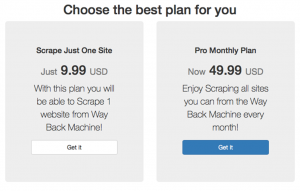 You can scrape one website for $9.99 and also choose the Pro Plan which allows you to scrape unlimited websites in a month for $49.99. The process to download/scrape a website is very easy. You just need to enter the URL of the website and Search. Select the day you want to scrape this site from and click on Start finally. You will have to wait for an email containing a zip file of the scraped website. It makes take from few minutes to few hours depending on the queue and the size of the website you requested to scrape. WayBack Downloader – This is another fantastic tool for downloading older versions of a website and rebuild it for your PBN. It would be really hard to download every page of the website individually along with the different files and images. WayBack Downloader makes it look very smooth for which you need to provide them the Wayback URL (eg. https://web.archive.org/web/*/http://www.thenextweb.com/) and not the URL of the website only. They also provide an additional service to integrate the site with WordPress and make it even simpler for you, though they charge a $30 fee for this task. This service offers 1 site download for $15, 2-4 websites for $12.5/site and 5+ websites for $7.5/site. I am sure you would be wondering why should you use WayBack Machine over the content writers to produce content for the PBN site. Well, it is not mandatory to use this method but this can be really helpful in some terms. Cost Effective – If you are hiring a content writer for $10/article, you can spend $9.99 to scrape the previous version of the website and use the content which is very relevant to the niche which will save you a lot of money in the long run. Feasible Option – It would be quite tough to mange a team of content writers if you own a large PBN of let’s say 50-100 websites (it may go up to 500-1000 sites). So using WayBack Machine here to scrape the old content would prove very efficient and time saving. SEO changes tracking – Using WayBack machine can help you in analyzing the website modifications that affected the traffic and even research the old links to the website you own now. With this, we come to the end of our guide on how to use WayBack Machine to reengineer an expired domain and scrape the old content which used to reside on that particular website. I hope the process was pretty clear and you now have a clear vision about what to choose to keep your PBN’s updated regularly so that they hold the rankings of your money website. SEO is an ever evolving branch and testing out new things can always help you so my recommendation is to keep on practicing new methods and record your results. That’s how you win the game, sound off in the comments section if you would like to discuss or ask us or just say us ‘Hi!’, we would love to hear from you! Some of you may have experiences setting up private blog networks for improving ranks on Google. Some may just be confused with the steps, which in turn yielding unsatisfying results. So today, I will come and reveal important factors that are called golden rules for private blog networks. If you follow these rules, the risk of getting deindexed will be lowered or never. The rules I mentioned is “the rules of no patterns”. Or simply said, whatever you do, try to make each of your websites of different patterns. When you started doing your private blog networks, you may have heard that you must have domain with PR 3 or above. That is not wrong. But if you imagine that your network consists of 100 websites all of which have PR 3. In the Google eyes, “why are all backlinks to this websites have PR3?” This is very unlikely of course. There is no website that can specify all of their own PR values of backlink. Do you get the picture? So the rule of non-pattern tells us that we should not make our web using the same pattern. We should register for domain with PR, no PR, some expired, some new. This gives your network a natural look. It is the same for making websites, someone has systematically set up their websites using the same pattern. Using links on footer and blogroll all the time. Same categories; posting articles at the same time; using the same theme on their websites. If Google judges one of these websites as spamming websites, they will start looking for other websites that have similar pattern. If they found these websites, they will deindex all of them. Very cruel indeed! If we now employ no-pattern rule – when Google found one low-quality websites, and try to search for other websites with the same/similar pattern. As we already make our websites with different patterns, so the risk of them finding all of our websites will be much decreased. Now someone may have questions that “What about links in article? How do you make it follow the no-pattern rule?” As many people get to the point and set up their blog network by putting link using keyword anchor. I want you to simply follow my reasoning as follow. Normally, people will link to your website when they think your web is good and useful. They want to introduce good websites on their page. What do they do with the link? Keywords, sentences, or direct URLs? I believe that the direct URLs method is the most popular one. However, what I suggest to you is to mix all of these types of keyword anchor. Keyword anchor is the name displayed for link, for example this is a keyword. We call “this is a keyword” the keyword anchor. It is true that link using keyword may gain more points from Google. But today Google uses percentage of keyword anchor as ways for punishment too. It means if you use too many keywords as anchor text, you may get banned. What I want you to know is that Google used to rely on keyword anchor when analyzing backlinks. For example, if you start a website for marketing Samsung Galaxy note 4 and the links are from keyword ‘Samsung Galaxy note 4,’ there will be more points than links from other keywords. But for today Google’s algorithm gets smarter and they rely need less and less for anchor keyword. Google can look at the context of an article whether what anchor text is. All in all, even you put your links as direct URLs to point to your website, Google will know what your website is all about. Hello my reader. You don’t have to know who I am. You don’t have to care where I come from. But what you will learn from this blog is making successful private blog network. You may have heard ‘bout private blog network can easily help boost your SEO ranking. The only problem you have is you don’t know how to do or even how to start!!! We start from the basic. Let’s talk about what private blog network is. Before going into what private blog network is, I like to tell you about the evolution of Google briefly. As Google main job is to deliver the best search result user wants to read. In the earlier, Google considers the number of links to web pages. The more links, the better ranks for those websites. These links are called backlinks. For example, we read this blog and find it useful, so we put a link to this blog on other website, we share it on facebook, we share it on related forum. When those SEO specialists know that backlink is important in ranking webpages, they make use of it. They put thousands of backlinks onto a single website. Google must adapt their algorithm that backlinks will get points for ranking webpages must be only backlink from different websites, different places. Implementing private blog network is making several different blogs on different hosts and put backlinks back to our main website. Now we are getting backlinks from various different websites. For making private blog network, there are lots of details that we need to know. I will cover to many topic later in this blog. At this point, there is a question, “Normally, I do SEO by posting on various web boards. Do I need to do private blog network?” If you want to control many different factors, you should do it. For example, if you post to web boards, you must follow their rules of posting. If not, they may delete your posts. However, if you have your own private blog network, you can do whatever you want. You may adjust your web so it suits to new algorithm. I 100% guarantee that it will not backfire you. If you do post on other web boards, you must find new web board and continue to do so indefinitely. Why do I say that blog network is a good long-term investment? We can configure our blog network as we like because it belongs to us. If we make it good, it will boost your ranking. When we make our web and want to increase our ranking on the search engine, we only need to place backlinks from our private blog network. By having blog network with expired domain, you will have the most valuable asset in the long term. Let’s compare the money you must spend in hiring other to do SEO. They charge you by keywords. The cost depends on the quality of the service providers. But the point is you must pay per keyword for rank. It can accumulate and costs you a lot comparing to making your blog network that we own to ourselves. In the long run, it is worth it as we can put as many keywords as we want. Unlimited. In addition, you can use your private blog network to generate your revenue in the future, for example by offering SEO service yourself.